This article is about the set that contains a C-3PO minifigure. For the set that contains a R2-D2 figure, see Tatooine Mini-build (Fan Expo Canada). The Tatooine Mini-build is a Star Wars: Episode IV A New Hope set sold during Celebration Anaheim. 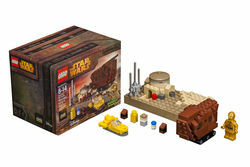 The set contains a C-3PO minifigure, mini brick-built droids, a mini landspeeder, mini sandcrawler and a mini model of the Lars homestead. This is a description taken from Star Wars Celebration 2015. Please do not modify it. 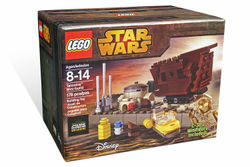 (visit this item's product page) Micro-scale LEGO replica of an iconic scene on Tatooine from Star Wars: Episode IV, builders can assemble Aunt Beru’s and Uncle Owen’s house, complete with a moisture collection machine. Next to the house is the Landspeeder that Luke Skywalker™ will use to begin his adventures. Also included in the mini landscape are micro versions of C-3PO and R2-D2, who are sold to Luke and Uncle Owen by the Jawas™ alongside of their micro-scale Sandcrawler™. The set also includes a C-3PO minifigure. Facts about "Tatooine Mini-build (Celebration Anaheim)"